Most people don’t like the gun cleaning box that comes with their cleaning kit and usually opt to upgrade it. By far the biggest complaint is about the poor quality of the carrying case. Most gun cleaning kits can’t afford to include a high quality gun cleaning case AND give you high quality brushes. Most kits also don’t have enough room in them for adding other important tools like cleaning rods, CLP, and anything else you might need. People generally complain that their carrying case is too big or too small. Well, we wanted to try to include a variety of different sizes on this list and the kits are the size they need to be to store all of your cleaning supplies. 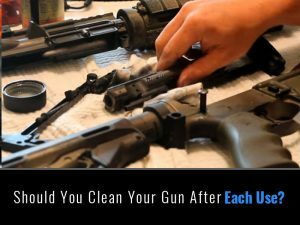 We spent a lot of time looking online for gun cleaning cases and here’s what we were able to find. This just might be the best designed gun cleaning box out there. 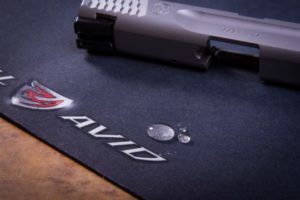 Designed by MTM, who’s known for making some of the highest quality ammo cases. There’s a section and container for everything you could possibly need to clean your guns. To top it off there are several gun holder pieces that you can pop into the sides to hold your gun while cleaning it. 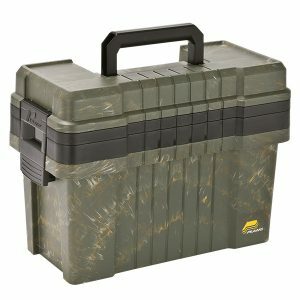 This box is designed for serious shooters that need a high quality gun cleaning storage box. 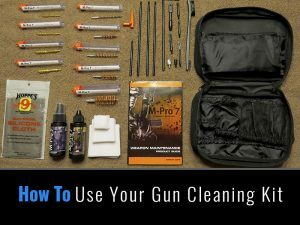 If you do a lot of shooting, then you do a lot of cleaning and having an amazing cleaning box can make your gun cleaning experience a lot easier and more enjoyable. The first thing to note is that this box is very spacious and very lightweight. Weighing only 6 pounds and measuring 24” x 11” x 8”, it has more tan enough room for all your gun cleaning and shooting supplies. Inside the box you’ll find to main compartments. The top tray can be removed and is where all your brushes and smaller tools are stored. The inner chamber can store larger items and includes the gun mounts for cleaning your rifles and shotguns. There are a total of 18 different compartments and includes two adjustable gun forks. The base store larger items and includes gun forks for holding your guns. Not many people could complain about this gun cleaning box. If you want to complain about It being to big that’s about it. Out of a couple hundred reviews there were a couple of people that didn’t like it. 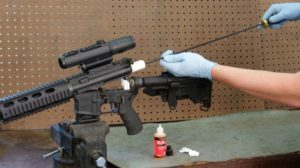 Keep in mind that this kit is designed for serious gun owners and is designed to clean all of your firearms. Overall, this is the best gun cleaning box currently on the market in 2017. After hours of searching for the best gun cleaning case, we decided on this on the Plano shooters case. 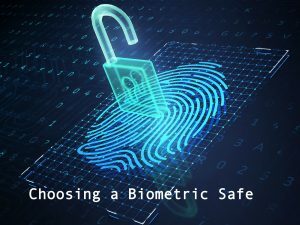 There are a lot of cases out there and it can be hard to choose. This Plano case is designed for gun cleaning kits and is a bit smaller than the larger cleaning boxes we previously reviewed. The case measures 15” x 6” x 9” and is the size of a standard fishing tackle box, maybe a little bit taller. It comes with two lift out trays, with the top tray for your tools and gun cleaning solvents and a larger bottom tray for more cleaning supplies and shooting equipment. For the price this is one of the best gun cleaning cases out there. It also includes two fork mounts for holding your rifle or shotgun while cleaning it. It’s not designed to be waterproof but in the reviews they say that it does well enough in fork mounts for holding your rifle or shotgun while cleaning it. Overall, a very good cleaning case with far better review than 99% of the standard cases you get with your gun cleaning kits. Finally a gun cleaning case with all 4 and 5 star reviews on Amazon. The complaints are very minor and most people either say it’s too big or too small. Well, if you need a bigger case then get a bigger case. If you ask me there’s plenty of room and the trays are high quality plastic. This is what you should expect from a high quality gun cleaning case. 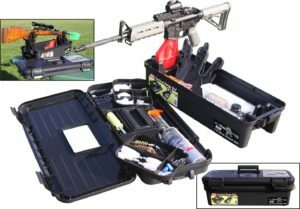 This gun cleaning toolbox is designed for cleaning all your firearms and comes with a variety of handy tools. Inside the gun cleaning box you’ll find two arm holders that you can use to hold your rifle and use your cleaning rod. The MTM Range Box comes with everything you need and plenty of space to clean your guns on the go. 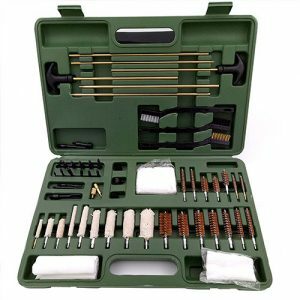 The top section of the gun cleaning toolbox comes with divider spaces for all your brushes, jags, solvents, shooting glasses, and other tools. There are a total of 18 compartments for everything you might need. Keeping all of your parts organized is very important and saves you a lot of time. The case is ideal for holding all your ammo and even a few handguns can fit inside it. Overall, one of the best gun cleaning toolboxes out there that we could find and we spent a lot of time looking! If you’re long for a gun cleaning box without complaints that you’re looking at it. By far this is one of the best cases out there and comes with everything you could possibly need, expect a gun cleaning kit of course. The only complaint I could find is in regard to the latches. If you don’t properly latch it you can get water or dirt to enter inside your kit. We wanted to find a gun cleaning storage box that is waterproof and you can simply store you cleaning supplies in their a long time without worrying. Many people have complained about their gun cleaning kits not being waterproof and getting all sorts of stuff inside it. A lot of cases are hard to clean and it can be a pain to do so. 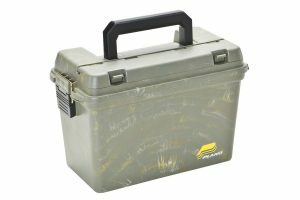 The Plano water-resistant gun cleaning storage box is a perfect option and is very inexpensive at under $20. It’s not really designed to be a gun cleaning box but it looks good and Plano is known for making some really high quality boxes. While this storage box doesn’t come with all the trays that the others come with, it should be able to work perfectly as a gun cleaning box. You can store just about anything in here and not have to worry about water getting in. Couldn’t find any complaints about this box and it looks very well made. This is a more affordable option in the under $20 price range for those looking for a good storage box for all the gun cleaning supplies.